Make these patterns your go to for baby gifts, charity drives, and all the precious babes in your life! These baby hat crochet patterns were designed to fit babies from birth through their first year. I’ve included two sizes below … a newborn hat for newborns through 6 months and a baby hat for 6 months through 1 year. And of course since babies all grow at different rates I included the circumference and hat height for each so you can gauge the size you would need for your baby. Need a different size? 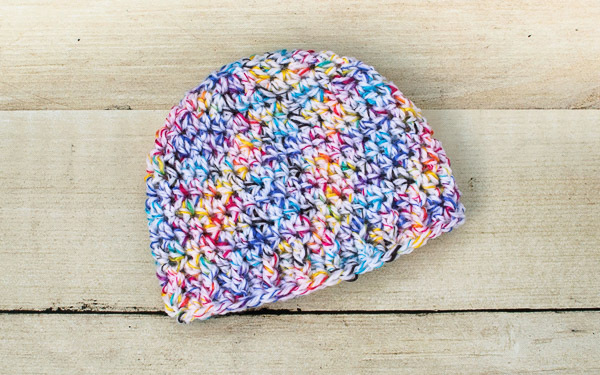 This handy Hat Sizing Guide can help you easily modify a pattern to fit any size you need. 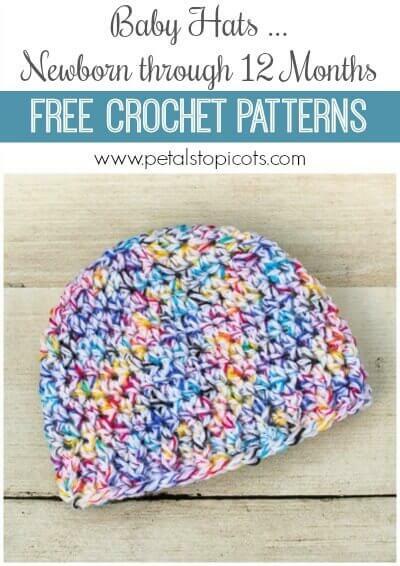 You can also find my Preemie Crochet Hat Patterns here and a Basic Adult Hat Pattern here. Gauge: approximately 11 hdc and 9 rows = 4 in. Note: I prefer starting rounds with a ch-1 followed by the first st of the round because I feel it leaves a less obvious “seam”; however, if you prefer the more traditional ch-2 start, count the ch-2 as a stitch and use it in place of the ch-1 and the first hdc (end of round stitch counts should remain the same). Make a magic ring (as an alternative to the magic ring, you can also ch 4 and join in the furthest ch from hook to form a ring). Round 1: Ch 1 (does not count as st here and throughout), work 8 hdc in ring, join — 8 sts. Round 2: Ch 1, work 2 hdc in same st as join and in each st around, join — 16 sts. Round 3: Ch 1, work 2 hdc in same st as join, 1 hdc in next, *2 hdc in next, 1 hdc in next, rep from * around, join — 24 sts. Round 4: Ch 1, work 2 hdc in same st as join, 1 hdc in each of the next 2 sts, *2 hdc in next, 1 hdc in each of the next 2 sts, rep from * around, join — 32 sts. Round 5: Ch 1, work 2 hdc in same st as join, 1 hdc in each of the next 3 sts, *2 hdc in next, 1 hdc in each of the next 3 sts, rep from * around, join — 40 sts. Round 6: Ch 1, work 1 hdc in same st as join and in each st around, join — 40 sts. Round 12: Ch 1, work 1 hdc in same st as join, 1 FPdc around next hdc, *1 hdc in next st, 1 FPdc around next, rep from * around, join — 40 sts. Round 13: Ch 1, work 1 hdc in same st as join, 1 FPdc around next FPdc, *1 hdc in next st, 1 FPdc around next FPdc, rep from * around, join — 40 sts. Fasten off and weave in ends. Add a decorative pom pom if desired. Round 6: Ch 1, work 2 hdc in same st as join, 1 hdc in each of the next 4 sts, *2 hdc in next, 1 hdc in each of the next 4 sts, rep from * around, join — 48 sts. Round 7: Ch 1, work 1 hdc in same st as join and in each st around, join — 48 sts. Round 14: Ch 1, work 1 hdc in same st as join, 1 FPdc around next hdc, *1 hdc in next st, 1 FPdc around next, rep from * around, join — 48 sts. Round 15: Ch 1, work 1 hdc in same st as join, 1 FPdc around next FPdc, *1 hdc in next st, 1 FPdc around next FPdc, rep from * around, join — 48 sts.